This activity is based on a series of photographs taken in 1903. 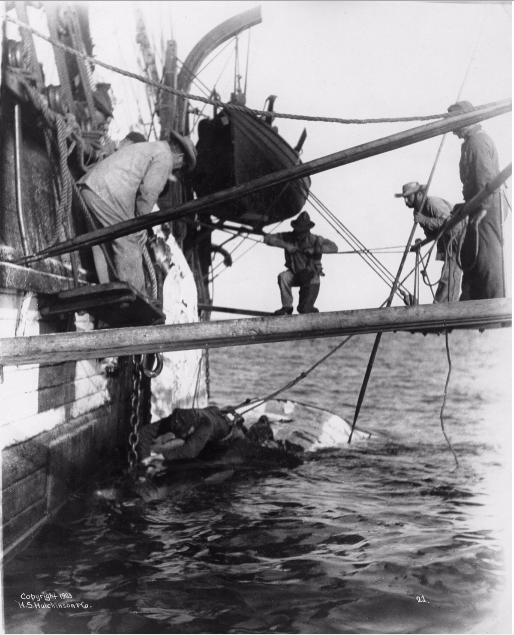 They document the harvesting, cutting, and hoisting aboard of parts of a right whale onto the whaling bark the California. 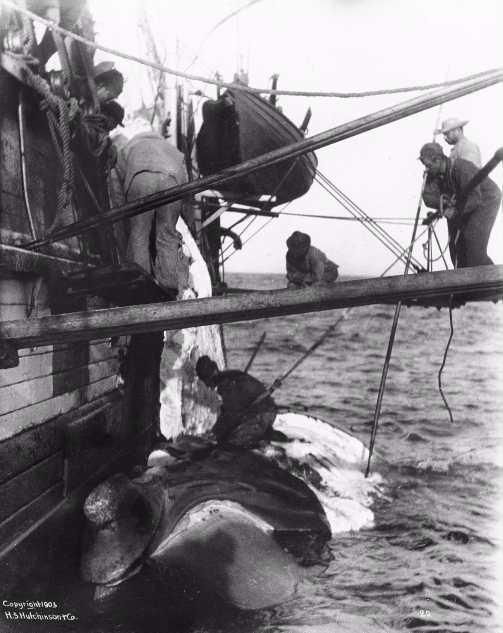 From these photographs we see the importance of the ship and the sailors as valuable resources in the whaling process, as well as the whale oil and baleen being harvested. Shipping, shipbuilding, and whaling play a large role in New England and Connecticut history, helping to spark the Industrial Revolution in New England. New Bedford became known as “The City That Lit the World,” and New London was the third-largest whale oil port in the United States. The whaling industry also depopulated whales in the Atlantic and Pacific Oceans. How have Connecticut’s maritime products and industries contributed to the history of America? How have Connecticut’s natural resources influenced the development of our state and its contribution to American history? How did industries such as whaling, manufacturing, and technology create Connecticut’s history and contribute to America’s story? Historically, what goods made in Connecticut have we traded elsewhere? Cutting in a right whale: View 1 – Mystic Seaport for Educators. Cutting in a right whale: View 2 -The Cutting In Stage – Mystic Seaport for Educators. Cutting in a right whale: View 3, Hoisting the Head – Mystic Seaport for Educators. What is happening in the photographs? How can they tell? What do they see? Where is the evidence? 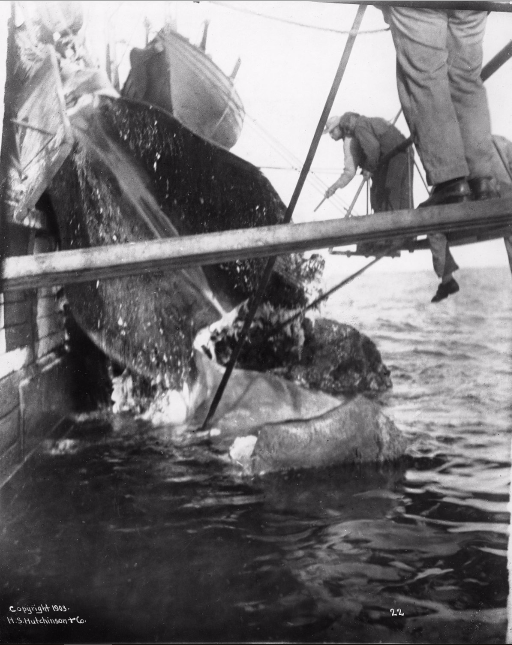 The pictures are a series showing a right whale being taken from the Atlantic Ocean and harvested for its resources. What is being gained from this harvest? What are the valuable resources in the pictures? What effect do these Connecticut sailors and the whaling industry have on the rest of the country? How did Connecticut’s contribution to the whaling industry affect the way the world viewed America at the time? In groups, have students design a new flag for the state of Connecticut to reflect our maritime history, and present their new flag to the class explaining and justifying each of the elements they included on the flag. Identify each symbol or design included on the flag. What is the significance of each element? Why did they choose to include these particular symbols?